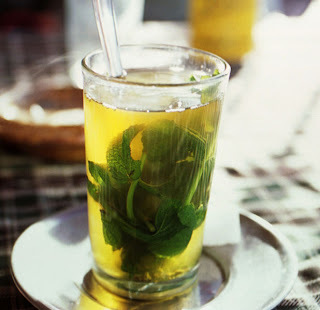 by the way green tea is prepared and consumed in this northafrican country. This tradition has spread to other countries of NorthAfrica, parts of the Sahel (the border zone in Africa between the Sahara to the north and the more fertile region to the south) and even southern Spain. every spoon of tea) and fresh mint are added and mixed into a teapot with a long, curved spout. This allows the tea to be poured into tiny glasses from a height of approximately half a meter to form a foamy head (surface). It is then returned once or twice to the teapot for a good mix.